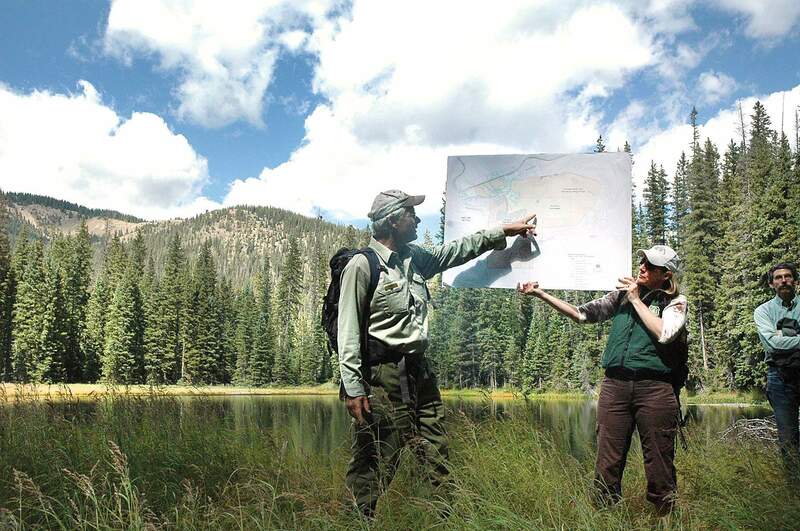 In 2011, Rio Grande National Forest District Ranger Tom Malacek shows people the location of wetlands and other features of Forest Service land that developer Red McCombs, who plans to build the Village at Wolf Creek resort town, wants to trade with the agency. Environmental groups say they have uncovered damning evidence that the National Forest Service was in collusion with Texas billionaire B.J. “Red” McCombs in his effort to build the Village at Wolf Creek and actively tried to cover it up. 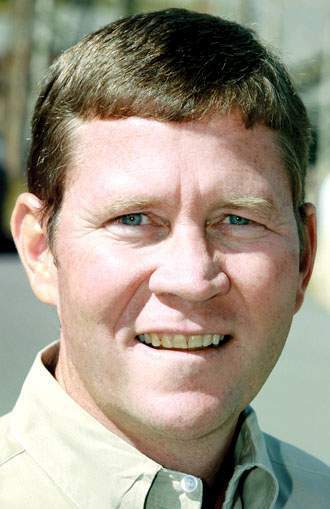 In tens of thousands of documents released by a federal court order in October and obtained by The Durango Herald this week, the groups say they found evidence that Forest Service personnel concealed or destroyed information related to the development proposal, allowed McCombs to influence environmental analyses and tried to prevent public scrutiny of documents relevant to decision-making. “None of us know what happened because of these active efforts to conceal the trail,” said Dan Olson, executive director of Durango-based San Juan Citizens Alliance, part of the Friends of Wolf Creek coalition. Forest Service officials reached this week deny that there was any attempt to cover up their actions, and the project manager for McCombs said there was never any attempt to exert political influence. McCombs has been planning since 1986 to build a sprawling resort at the base of the Wolf Creek Ski Area, which stands at 10,300-feet elevation, but he has met resistance from members of the public and environmental groups fighting to protect the scenic wilderness that surrounds the southern San Juan Mountains. The decades-long fight has involved challenges to government decisions and lawsuits, including a case headed to Federal District Court in Denver in the spring or summer. The latest battle involves the May 2014 approval by Rio Grande Forest Service Supervisor Dan Dallas of an exchange of 200 acres of Forest Service land for 177 acres of privately owned property, effectively giving the Village at Wolf Creek project the access to U.S. Highway 160 it has lacked since in the 1980s. Before the swap was approved, Rio Grande National Forest officials were tasked with weighing the impacts to the ecosystem in an Environmental Impact Statement, which project opponents say was narrow in its analysis and influenced by McCombs. After poring over nearly 60,000 Forest Service documents the past four months, the Friends of Wolf Creek, a coalition of environmental groups, are adamant that a new EIS without outside influence must be conducted. The emails, Olson said, show a prevalent fear among Rio Grande National Forest staff of a FOIA request, and proof they actively tried to conceal or destroy key moments in decision-making related to the Village at Wolf Creek. “I’ll have (our lawyer) send it electronically through an email ... so it will remain attorney-client privilege and not subject to FOIA,” Ghormley wrote. It’s hard to tell what the Forest Service was hiding, Olson said, because the Friends of Wolf Creek have access only to the emails where wildlife officials instruct staffers to cover up potentially incriminating information. “They just forgot to burn the emails that say to burn the emails,” Olson said. However, the Friends of Wolf Creek suspect it has to do with possible undue influence of McCombs, a powerful Texas billionaire. McCombs, now 88, made his fortune in the auto and energy industries. He was a co-founder of Clear Channel, owned several sports teams and is on Forbes 400 list of the richest men in America, with an estimated worth of $1.5 billion. In 1986, McCombs was part of a property venture that sought to trade 1,631 acres of degraded land for 420 acres of Forest Service land near the base of Wolf Creek Ski Area for a 208-unit development at that time. “The Forest Service initially turned down the proposal but reversed course several weeks later, without any explanation, and approved the land exchange,” Maribeth Gustafson, a deputy forester, wrote to a colleague in 2014 providing “background information” about the project. The email was included in the recent FOIA release. “It is commonly understood that Mr. McCombs brought political pressure to bear to realize his dream to develop the ski area,” the email said. 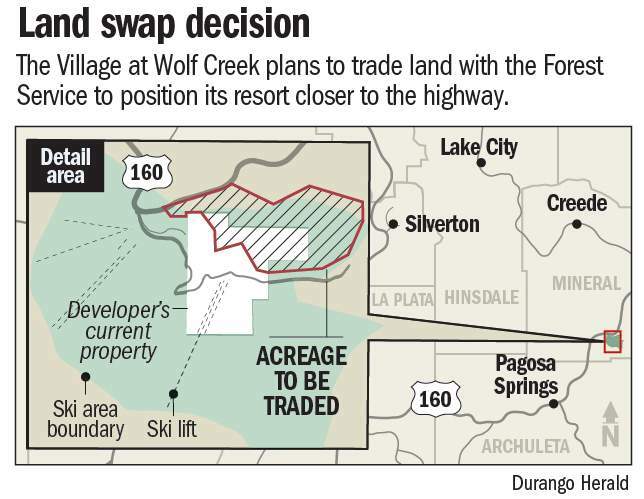 As the years passed, the proposed development grew into an Aspen-size resort with hotels, townhouses, condominiums and restaurants, with a capacity for 8,000 people near the Wolf Creek Ski Area, a relatively small family-owned operation. The problem for McCombs and his fellow developers is that the property has no access to Highway 160, and he needs the Forest Service’s approval of an EIS that would provide a right of entry. He has tried a number of tactics to avoid an Environmental Impact Statement, including lobbying then-Texas congressmen Tom Delay in 2001 to put forth legislation removing the necessity – an effort that failed. In 2004, when Mineral County approved the Village at Wolf Creek proposal, a Colorado District Court found the road access was inadequate and reversed the county’s decision. The Friends of Wolf Creek contend McCombs was involved in developing the county’s land-use code at that time. Two years later, in 2006, environmental groups filed a lawsuit that argued the Forest Service drafted an EIS that was heavily influenced by McCombs, and ignored public opposition. The federal agency settled by agreeing to develop a new EIS. The emails show McCombs regularly threatened to influence the outcome of environmental studies in his project’s favor, Olson said. After McCombs’ attempt to skirt the EIS process failed, Gustafson braced her colleague for the impending fallout. Clint Jones, the project manager for the Village at Wolf Creek, said there was no pressure put on the Forest Service to influence any of the agency’s decisions. Instead, Jones said there was growing frustration that Forest Service officials kept the developers on the outside. He said the only time project managers called the Forest Service was to check in on the decision for the EIS that was continually delayed, and provide project information. Rio Grande’s forest supervisor Dan Dallas said last week he is limited in what he can comment on because the Forest Service is in litigation with the Friends of Wolf Creek. But he wants the public to understand there is context to every email released. “I just wish the context would be fully evaluated before people jump to an assumption,” Dallas said. When asked about Malecek’s “swimming with sharks” email that claims Dallas was concerned about potentially damaging information and the need to hide correspondences from FOIA, he said: “It’s an unfortunate use of words, certainly, but there is no, again, I was asking folks to be disciplined about working out internal questions between each other. Mike Blakeman, public affairs specialist for the Rio Grande National Forest, said the local Forest Service is frustrated because it is easy to pull out emails and develop stories around them. Both men contend any claims of a cover-up or collusion with McCombs will be proved false once hearings start for the Friends of Wolf Creek’s legal complaint against the Forest Service about the most recent EIS. Forest Service officials in Washington, D.C., and Denver declined to comment for this article, saying the agency does not discuss matters in litigation. The 30-year battle over the proposed development will enter its next stage in Federal District Court in Denver this spring or summer, Stills said. “We want the judge to understand what happened, and see if undue influence has prevented the public and people in charge of making a fully informed decision,” he said. But Stills added that the recent batch of emails released represent a sliver of what went on behind the scenes. All construction has been halted until the legal complaint is settled, and a separate FOIA request is pending. However, Olson remains skeptical. Environmentalists take Wolf Creek fight to D.C.